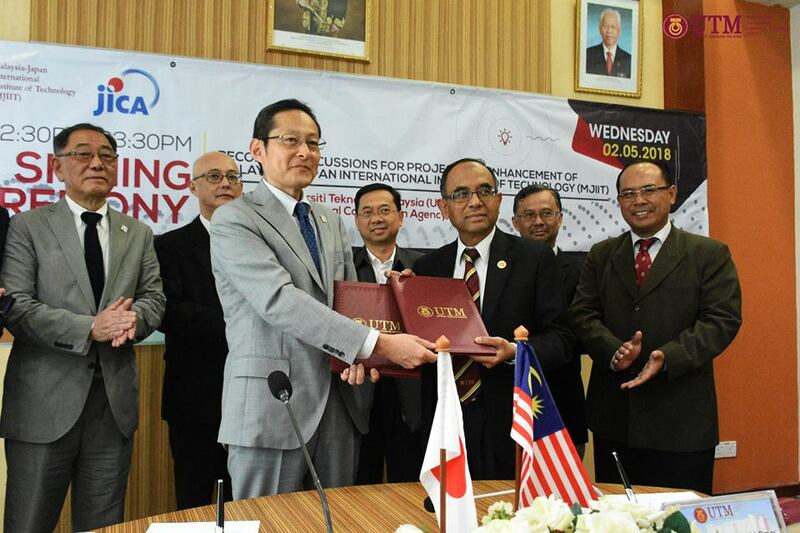 KUALA LUMPUR, 2 May 2018 – The Malaysia-Japan International Institute of Technology (MJIIT) Universiti Teknologi Malaysia (UTM) and Japan International Cooperation (JICA) signed the ‘Record of Discussions for MJIIT UTM 2nd Phase Technical Cooperation Project Agreed upon between Universiti Teknologi Malaysia and Japan International Cooperation Agency. 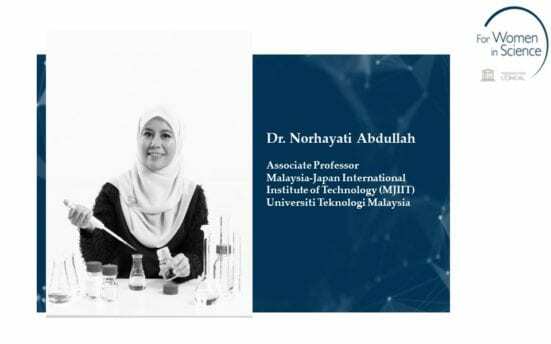 In keeping the momentum from the years before, the Record of Discussions for MJIIT UTM 2nd Phase Technical Cooperation Project Agreed upon between Universiti Teknologi Malaysia and Japan International Cooperation Agency was signed by Prof. Datuk Ir. Dr. Wahid bin Omar, Vice Chancellor of UTM and Mr. Kensuke Fukawa, Chief Representative, JICA Malaysia Office. The memorable signing is witnessed by Mr. Orikasa Hiroyuki, Minister of Japan to Malaysia, Mr. Ogawa Koichi, President of Japan-Malaysia Association, Mr Moribayashi Takashi, Vice President of Japan-Malaysia Association, Prof. Datuk Dr. Ahmad Fauzi Ismail, Deputy Vice-Chancellor of Research & Innovation UTM, Prof. Dr. Shamsul Sahibuddin, Pro-Vice Chancellor UTM Kuala Lumpur and Prof. Dr. Ali Selamat, Dean of MJIIT. An exclusive signing session was arranged to commemorate the long-standing partnership and cooperation between UTM through MJIIT with JICA. This will mark the beginning of a Project Period of five years between MJIIT and JICA, which is reflected as the Second Phase of the G-to-G project between the Governments of Malaysia and Japan, respectively. The First Phase of Project was initiated for the period of 2010 until 2017 whilst the Second Phase of Project will continue from 2018 until 2023. The Second Phase Project aims to strengthen the Japanese-oriented Engineering Education and research at MJIIT through cooperation with Japanese Universities and industrial partners. In this regards, MJIIT hopes to develop human resources and capacity building that will in future contribute to the industrial sector of neighbouring ASEAN countries. The Second Phase Project will establish and strengthen the following elements inclusive of laboratory-based education (LBE) at designated iKohza laboratories, sustainable collaboration with Japanese Universities in education and research as well as industry collaboration. In this Project, MJIIT aims to develop human resources and capacity who will in future contribute to the industrial sector of ASEAN countries. 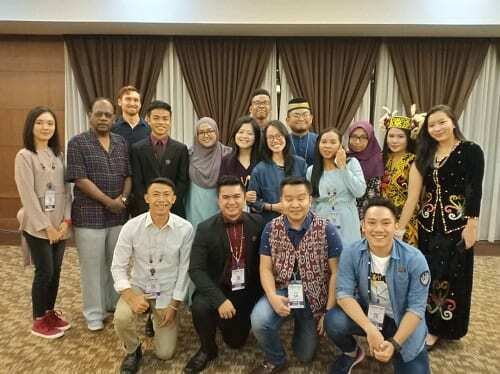 To date, MJIIT has received 48 ASEAN students coming from Indonesia, Vietnam, Cambodia, Thailand and Myanmar under the JAIF scholarships, amounting USD 2 million. 22 students have completed their postgraduate studies, whereas 26 students are in the pipeline to graduate. By the year 2023, MJIIT aims to increase expected to increase our students to 3000. Various academic and cultural activities have been conducted throughout the years of partnership between MJIIT and JICA. The Japan Day 2017 took us by storm with special and unique Japanese Budo demonstration supported by the Japanese Embassy and the Nippon Budokan Foundation in conjunction with the 60th Anniversary of the Establishment of Diplomatic Relations between Malaysia and Japan. The event was officiated by Yang Berhormat Dato’ Seri Idris Jusoh, Minister of Higher Education Malaysia and attended by His Excellency Dr Makio Miyagawa Ambassador of Japan to Malaysia, Embassy of Japan in Malaysia. In addition, UTM through MJIIT feels proud to have hosted renown speakers such as Dato’ Akihiro Nikkaku, President of Toray Industries Inc. Japan. UTM is truly honored to be the first Malaysian University to host him in our Leadership Lecture program at UTM Kuala Lumpur. Industries from Malaysia, such as Perodua and Proton also contributed in sharing of industry-based knowledge through both lecture series and industrial grants. 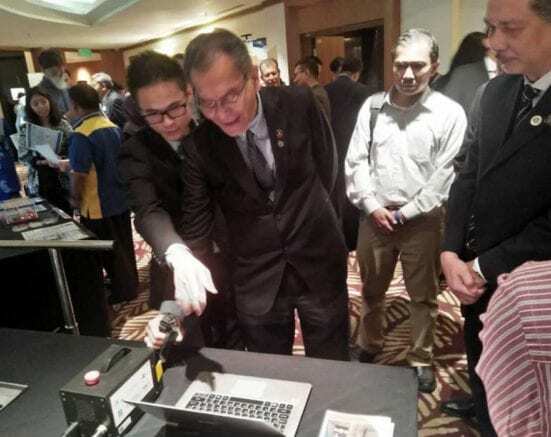 MJIIT also received full support from Japanese-based industries such as Takasago Thermal Engineering, Rohm-Wako, Daikin and Toyota in continuing to enhance the capacity, knowledge, innovation and nurture future leaders in the engineering field among Malaysians as desired by the government. Continuing the momentum of supports, working with leading engineering organisations in Malaysia and Japan, MJIIT organized the Fourth Career Fair 2018 which aims to offer opportunities to prospective graduates in landing their dream career as well as learn all about the corporate world, as part of concerted efforts for career development support for students. The Career Fair 2018 successfully gathered 37 top performing experienced engineering companies in a casual and engaging setting allowing students to submit their professional credentials on-site and taking advantage of the walk-in interviews provided during the event. Earlier this year, Prof. Dr. Ali Selamat has signed the Minute of Meeting between MJIIT and JICA on the evaluation of MJIIT Phase One progress and achievements. The Institution of Engineers Malaysia (IEM) Gold Medal Award overall winner, Abdul Syakir Abdul Wahab, 23 years old from Melaka is an extraordinary lad. As a final year student of Chemical Process Engineering at UTM-MJIIT, Abdul Syakir went through his 3-months industrial training at Daido Metal Co. Ltd., in Nagoya Aichi-Ken, Japan. Awarded with Tokoh Akademik Kediaman Siswa Jaya UTMKL in 2018 for Degree category, he was the former Director for MJIIT Entrepreneur Day 2016 and contributed as one of the crews for the MJIIT Sports Day in the same year. Ahmad Syakir is known for his active involvement in various college activities such as Ace Your Future 2.0 and many others. Despite his dynamic contributions and participations in various extra curricular activities, Ahmad Syakir demonstrated an impressive academic achievement being an A-star student at MJIIT. Through careful selection by the Faculty panel members, Ahmad Syakir successfully went through the screening process for the IEM Gold Medal Award nomination. The prestigious IEM Gold Medal Award was conferred by IEM for the best final year engineering student nominated by local institution of higher learning. Congratulations to Ahmad Syakir for the conferment of the prestigious award by IEM during the 59th Institution of Engineers Malaysia (IEM) Annual Dinner 2018. 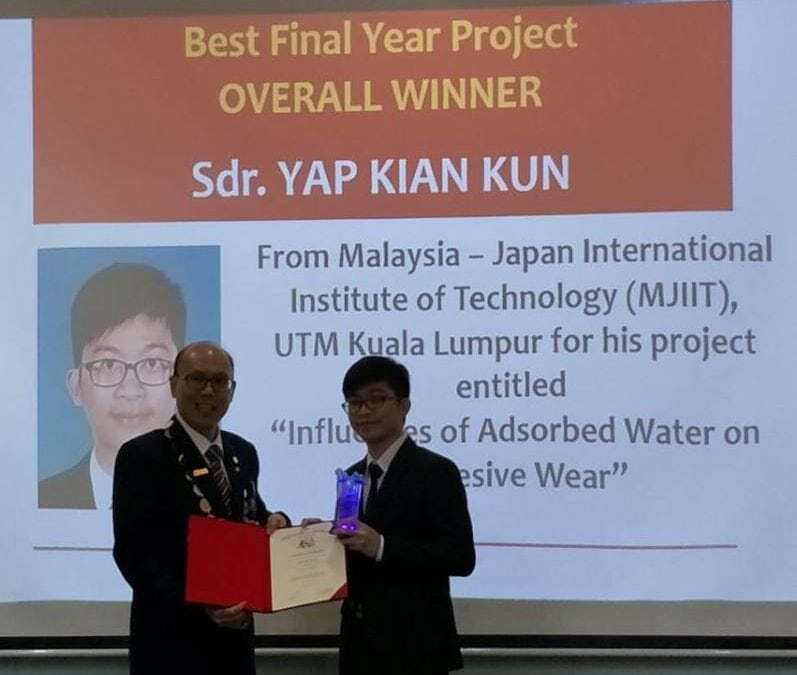 Meanwhile, Yap Kian Kun, a final year student of Mechanical Precision Engineering also from UTM-MJIIT was recipient of the prestigious Tan Sri Hj Yusoff Ibrahim Best Final Year Project – Overall Winner. The IEM and the Institution of Engineering and Technology (IET) jointly organized the final year project competition. Opened to all Universities, UTM-MJIIT nominated Yap Kian Kun’s excellent final year dissertation that claimed the winning title. The dissertation entitled “Influences of Adsorbed Water on Adhesive Wear” was supervised by Professor Dr Kanao Fukuda, Head of Tribology and Precision Machining Laboratory (TriPreM) iKohza at UTM-MJIIT. The award was delivered by Ir Dr Tan Yean Chin, President of IEM at Wisma IEM petaling Jaya during the IEM Annual General Meeting.